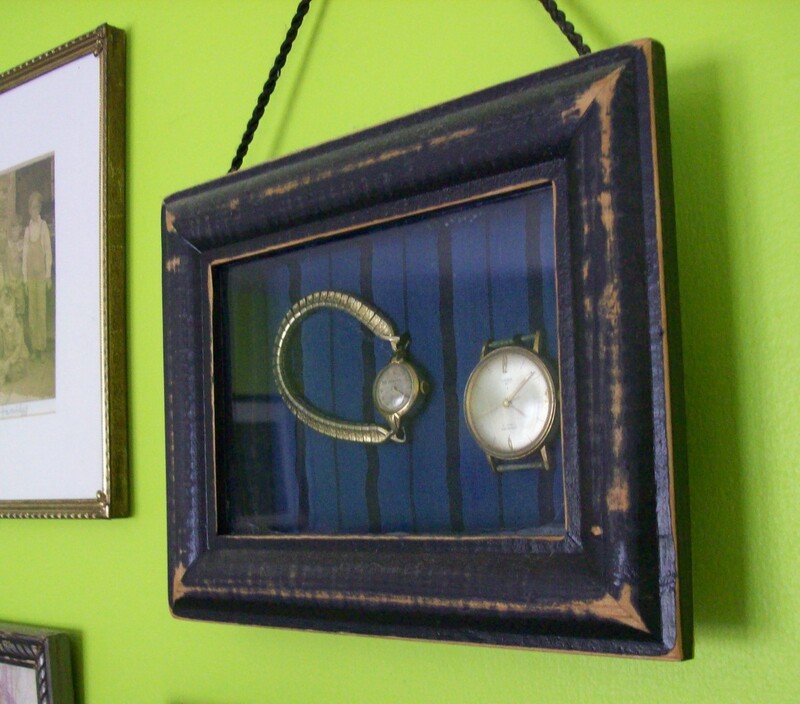 A handmade shadowbox is a great way to display crafts or collectibles. This is a guide about making a shadow box. Here's a way to get your family mementos out of old shoe boxes in the attic or jewelry boxes in your dresser drawers and into display boxes where they can be enjoyed every day. 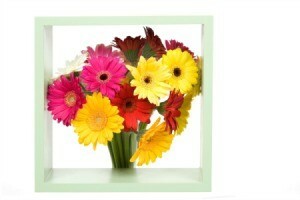 Shadow boxes are not so difficult to make and will save you big bucks on the price of buying them ready-made. Find a picture frame that you like and one that suits the item you want to display. 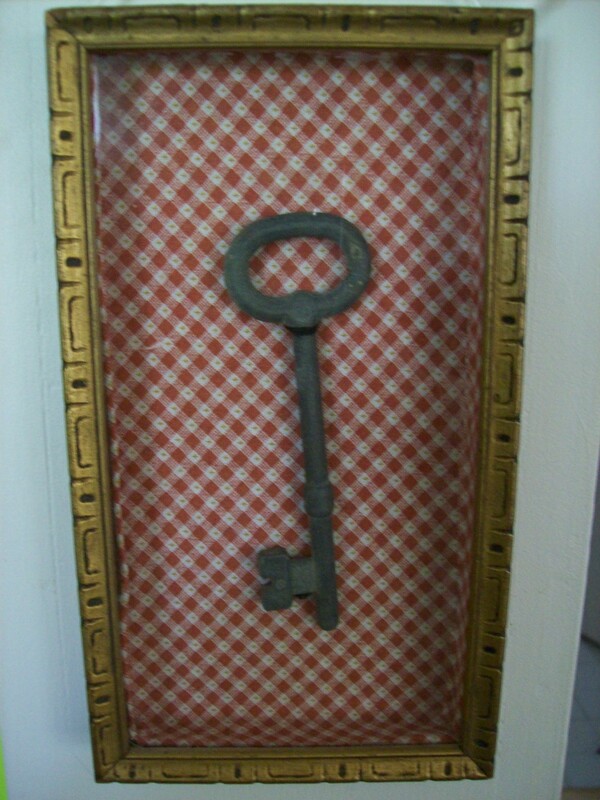 Since I was going to display vintage items, I distressed the frame a bit to match. Take the back off of the frame and use it to measure width and length that your shadow box will need to be to fit into the frame opening. You also have to measure the depth of the box based on the size of the item you will be displaying. My parents' watches were fairly flat, as was the skeleton key, so the depth of these boxes was only about an inch deep. I constructed one of the boxes out of balsa wood from the craft store. The other one is made from an old cereal box. The balsa wood is glued together, but the cereal box is only taped, much easier to make and adjust size if you need to. Decide on a covering for the box. Nice craft paper cut to size or fabric works well. I chose to use fabric because I had the colors I wanted on hand at the time. I used craft glue to attach the fabric to the box. After it was completely dry, I attached my display items into the box with sharp needle and thread or fishing line if you don't want it to be seen easily. Then fitted the box into the frame opening using some hot glue to hold it in place. If you measured well, you won't need much glue; the box will be snug. Now it's ready for the wall. I knew that I needed something on one of my walls so I went to the garage and found 1/2 inch by 4 inch lumber. I cut the size box that I wanted and glued it together. I let the glue dry and painted with watered down acrylics. 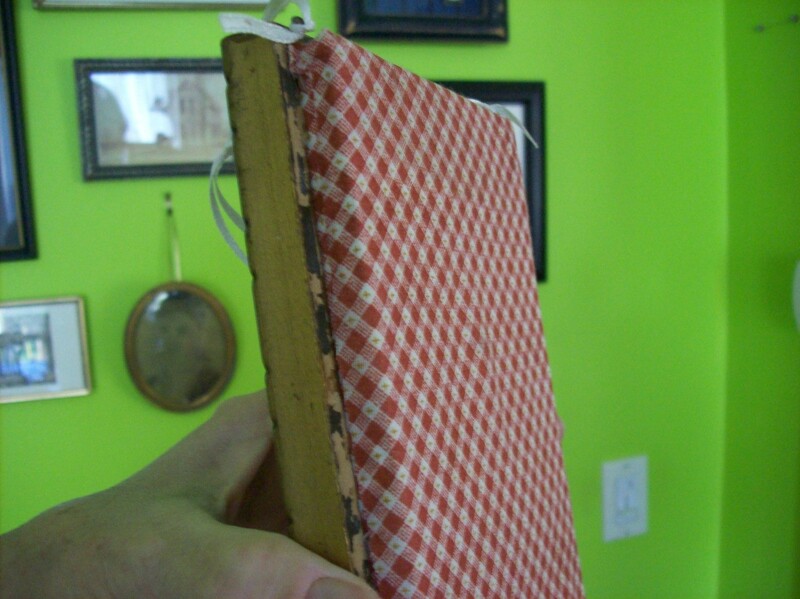 Next I found old scraps of fabric and assembled a doll free hand. A couple of $1 store extras and you have a shadowbox. 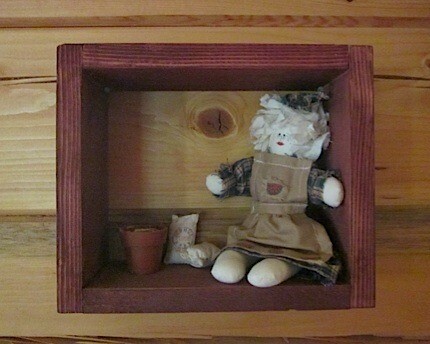 You can put anything you like in your box, I sew a little bit so I made the doll. Paint with a rag and watered down acrylic color you'd like. Put together your shadowbox scene. I used a doll, plastic flower pot, and flour sack. I am putting together a 16 inch x 20 inch shadow box with photos from several paddle wheel riverboats we have been on. Any ideas? Shadow boxes are a great way to display treasured collectibles. You can of course buy them, but why not consider using a sturdy recycled candy box and create your own unique display. 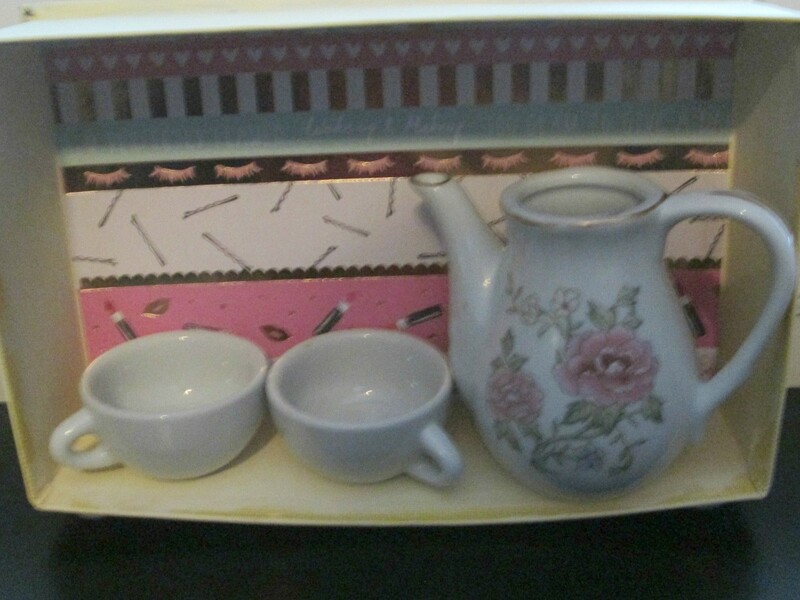 This is a guide about repurposing a candy box into shadow boxes.